Britain and India to form cyber-crime fighting duo? 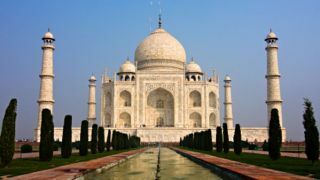 The Taj Mahal - probably not a target for cyber-crime. But who knows? Prime minister David Cameron hopes to make India the Robin to Britain's Batman as the two nations enter talks about uniting to take on cyber-crime. Cameron is currently in India trying to convince one of the most increasingly powerful nations that the UK is absolutely, definitely the kind of country that it should have as a friend. And one of the obvious collaborations is in cyber-crime and IT, where the UK has a decent track-record and India has a bit of a burgeoning problem. The British Prime Minister has stressed the UK's "competitive and technological" advantage to his counterpart, talking up the potential benefits to India. There are obviously reasons beyond the economic at play, given the amount of UK personal data stored in India because of the well-publicised outsourcing of help centres to the Asian giant. But clearly Britain is keen to stay friendly with a nation that used to be a jewel in its Empire, shares its love for tea and cricket and, most importantly, is expected to be in the top three economies in the world by 2030.